War for Science: Join the ‘A’ Week on Facebook! If you want to help raise awareness that world is full of people that are “good without God”, then take part in the ‘A’ week on Facebook from 29th March to 6th April! Just change your Facebook profile picture to the scarlet ‘A’! Through the ‘A’ week, it is hoped that peoples of different faiths will understand that there are much more atheists than they think, and that we can live ethical, moral, and good lives without adhering to religious dogma – don’t you just get sick of the blatant claims that fundamentalists say about atheism? So let’s take part in the ‘A’ week! 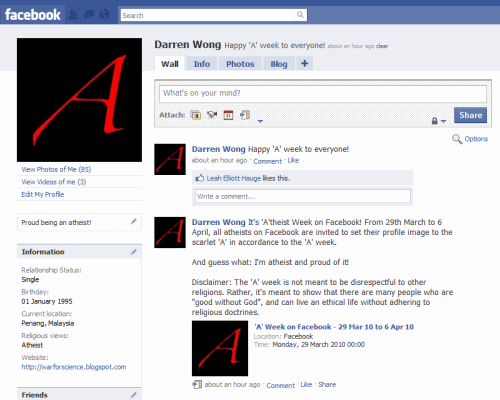 That's my Facebook profile on 'A' week! Must we change every aspect of our profile?